I take my inspiration from the two Irina/Irena-s, each pronouncing their names slightly differently. Irina Gorin is the ingenious piano teacher from Carmel, Indiana via the Ukraine, and Irena Orlov is from Washington D.C.’s Levine School of Music via Leningrad. They both inspire students to explore and draw out their deepest creative expression. That’s what we should all be doing in our personal practice sanctuaries. I certainly try to evaluate and re-evaluate my own performances, whether they’re recorded for myself to review, or for You Tube. Regardless of having an audience of one, or many, the process of learning from experience, examining phrasing, physical comportment, and anything that might have intruded upon a free flow of physical and emotional expression (there’s that word again) is worth noticing. That’s why I believe that videotaping yourself is an amazing teaching tool– one that can spur musical growth if you, the player, can distance yourself enough from the recorded sample to make some valuable observations. In other words, don’t be hard on yourself. Look at the mirror of your playing like it was someone else’s image– Think of a friend, whom you would not harshly criticize. Underline “O” for objectivity. This type of mirrored self-analysis is the next best thing to having a teacher present looking over your shoulder. Or maybe you don’t want anyone encroaching on your space. Give yourself a breather and do a little self-assessment. If you can spot places in your recording where something went awry, and not necessarily a glut of conspicuously wrong notes, you can try to pinpoint a physical problem, where perhaps a tense arm or wrist got in the way. You might remember at this moment, that you lost your breath and became anxious. Every aspect of one’s mental state and respiration factor into a total performance. Musical inspiration or intuition are not enough to get a pianist from the first measure to the final cadence. There must be a pacing, just like athletes know. Pianists are part athlete, part Terpsichore or any nyphm in the forest you choose to be–and part split personality when they’re playing. Vladimir Horowitz talked about fire and ice states when tackling the warhorses. 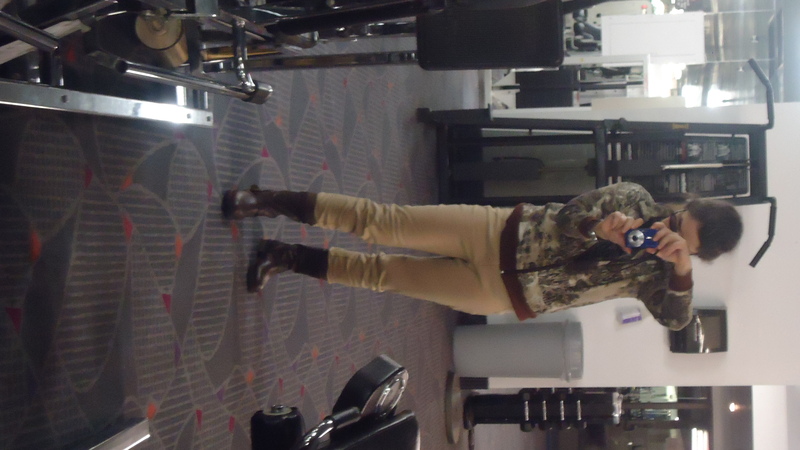 Which reminds me that today, a few hours before I attempted to record the whip-lashing, nerve-splitting, Bach Invention 8 on my iMac, I dashed off to Bally’s Gym, with my boots on, no less, and did a self-instigated photo shoot. Actually I aimed the silly Sony Cybershot at the mirror, not realizing that the flash (an automatic setting) would obliterate me, like I was blown up in one of those superhero video games. But at last, I survived once I knocked out the flash. My goal was to get a pic of myself working out on the Gravitron where I build upper body strength and feel a good workout for my arms. It’s really helps leverage weight into the keys, so I strongly recommend it. Here’s a fleeting look: I set the weight at 70, which means I’m pulling about 45 pounds. 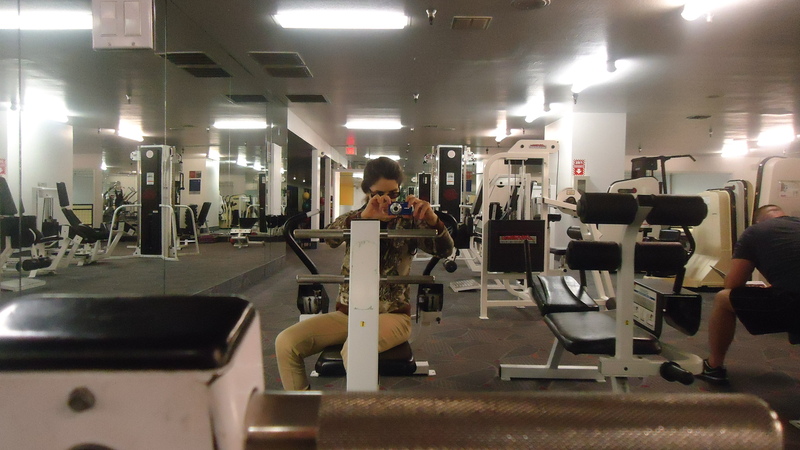 I follow up with 30-minutes of leg press, deep breathing all the way through. Not to forget, that behind every performance, especially one being recorded, there’s a cat lurking in the wings ready to pounce at the wrong moment, sending any and all music to the trash! 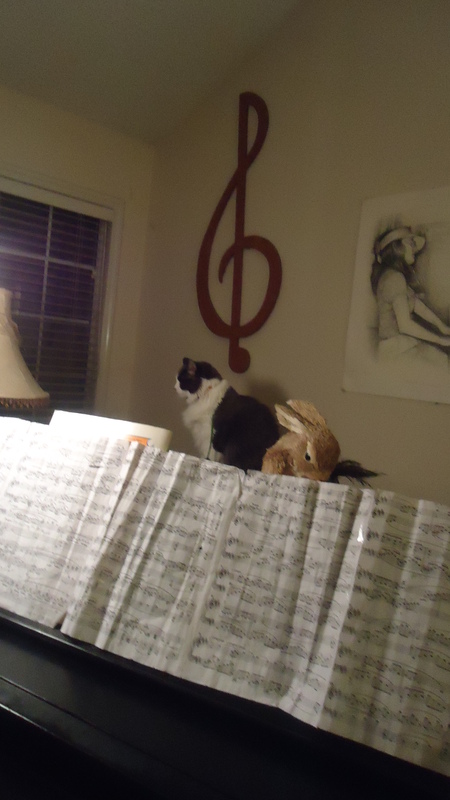 So make sure when you sit down to videotape yourself, that your feline is not permitted on the piano, in the piano, or near the piano. In this instance, Aiden was about to leap to the window sill to make his favorite racket, pawing the blinds. Hi, I enjoyed your article. I just had a couple of questions maybe you could answer. I have been playing piano for about six years, was self-taught and for the last year have finally gone to piano teacher to work out bad habits (and learn jazz theory) obtained from lack of technical training when first learning. One constant that he notices with my playing is wrist and forearm tension. Is there any advise you can give for relaxing my arms and wrists? Also, I stumbled on your article while searching for gym routines that can help with piano. Are there any other specific things you can do in the gym that help build arm, wrist, finger strength, ect. geared towards piano? Thank you for your time and hope to hear from you soon! Thanks for sharing your piano learning adventure. Many students tighten up wrists and forearms when they play, so I advise them to use some mental imagery to relax. For one thing you can bend over and let your arms hang, letting go of all muscle resistance. When you then stand upright, imagine what it felt like to be like a ragamuffin, or like a marionette on puppet strings..The other maneuver I recommend is elevating your arms, then making believe they are like wet clothes hanging OVER a clothesline.. Once that relaxed heaviness is felt, bring your arms, hands gently down to the keyboard, still imagining that your arms are SUSPENDED. As far as hand position, you should replicate what it’s like to hang your hands in the air with the wrists naturally bending. Then bring the hand down to the keys without trying to create a fixed, rigid hand position. A good test, is shaking out your hands and then bringing them down to the piano. It’s impossible to shake out hands that are held in a rigid arched position. If you watch the technique video I produced recently, a day or so ago, where I started with five finger positions you can observe my wrist undulating—and actually in all my teaching videos I do emphasize the supple wrist and for longer passages a rainbow like, arch motion. Staccato becomes a snipped legato that is shaped just like the legato playing.. When I go to the gym, I build strength in my upper body by going on the Gravitron pulling about 40 pounds of resistance..I like to apply the dead weight down through my arms and into flexible wrists. Especially for big Fortissimo chords. Do you work out with heavy weights/ I just wondered because I find that if I’ve worked out with heavy weights then my finger dexterity is impeded for several days. I absolutely DON’T work out with heavy weights, or any weights, period for the same reason you enumerated, and because my wrists are adversely strained with them. 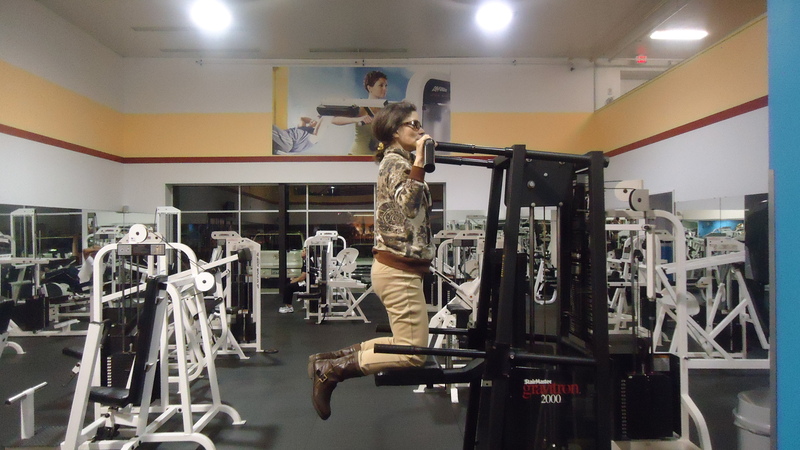 I just do the Gravitron to build my upper body strength..and leg pushes…That’s it.. I also use another machine that I pull up with.